Each of the 7 fleets invested in forms of fleet fuel management. These trucks are equipped with new technology, are designed with aerodynamics, and are driven with efficiency. The fleets are being monitored as part of a cross-country roadshow. In order to measure fleet fuel efficiency, each of the trucks are equipped with Geotab GO7 tracking devices. 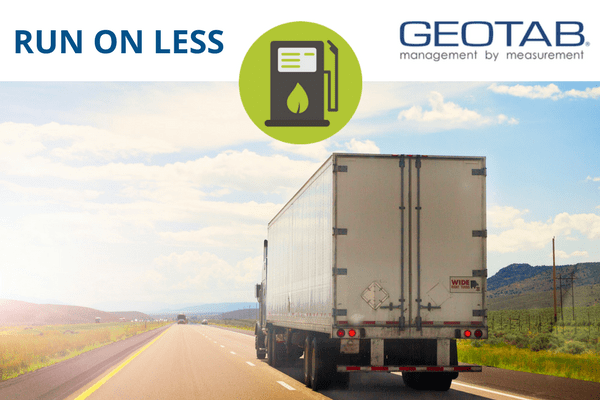 Geotab collects real-time fuel consumption data. At the end of each day, this data is summarized into a fleet fuel economy report. As of Day 9, the cumulative results show that the 7 fleets have an MPG rating of 10.2. This exceeds the fleet fuel efficiency target of 9.0. Let’s meet some of the drivers & how they are increasing fleet fuel efficiency. Henry Albert is the business owner and one of the drivers at Albert Transport. 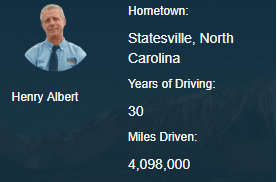 Albert drove since 1983 and noticed huge advancements in fleet fuel management. He commented that “smoothness of the ride, the amount of torque that today’s engines have, and automated manual transmission” have all helped him save fuel. Trailer license plate. Albert noticed that the placement of license plates makes a difference to fuel consumption. Albert and his team of engineers calculated that mounting the license plate below the tail light helps with windflow and reducing fuel consumption. Thin soled shoes. What are the best shoes for driving? Thin soled shoes are ideal for driving because it allows the driver to feel the pedal and to apply the right amount of pressure. This improves fuel efficiency by reducing harsh stops and harsh acceleration. 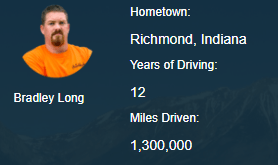 Brad Long has been driving for over 10 years. This caused him to appreciate fuel efficiency. Long says, “Fuel efficiency is important for me because that’s more miles I can drive before I need to fuel again.” He adds, “Also, I receive a fuel bonus for saving that fuel!”. Asset Management. Hirschbach closely manages the age of its equipment. All of their trucks are 3 to 4 years old while all of their trailers are 5 years old. This reduces the fleet’s maintenance cost and reduces fuel expense. Adaptive Cruise Control. ACC is a system that keeps a safe distance between the truck and the vehicle ahead by adjusting the truck’s speed. Tire systems. Another part of Hirschbach’s fuel strategy is to use a tire pressure system. Its current system does two things. Firstly, it measures what the current tire pressure is. Secondly, it auto inflates or auto deflates tires based on the tire pressure. This improves tire life and decreases fuel expense. Tommy has been driving for over 30 years. He noticed that fuel mileage has changed dramatically to when he started Frito-Lay. 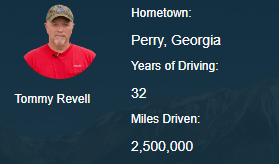 The company increased their performance from 4-5 MPG to over 9 MPG over Revell’s employment. Idle Shutdown System. Idling management is an important part of fleet fuel reduction. Idle shutdown systems save fuel by shutting down the engine after the truck idles over a specified amount of time. Aerodynamic Fleets. Another initiative is choosing aerodynamic fleet models. Some of these add-ons may include bumpers with lower dams, side skirts, and wheel covers. These add-ons redirect wind around the truck and increase the easiness of driving.